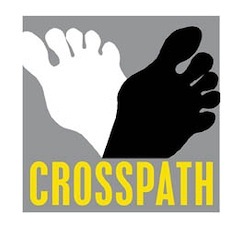 Crosspath is a cross-cultural performing arts company that was co-founded in 2010 by poets John Agard and Grace Nichols and theatremaker Mark C. Hewitt. Crosspath aims to bridge poetry and theatre through a celebration of resonant text and orality. Fusing a range of traditions and linking cultures, we bring the communal energy of folk narrative, mythology, music, panto and the carnivalesque to contemporary issues and hidden histories. Crosspath strives to be a democratic company. Intrinsic to the concept is the flexible use of space; leaving much of the setting to the audience’s imagination so that shows can be staged and adapted in non-theatre spaces and environments, such as community centres, museums, libraries, schools and village halls. The company is based in Lewes, Sussex. Crosspath also produces celebratory one-off events, such as its contribution to the World Poetry Movement's global poetry day. Feel free to contact us via this website.